Flight is one of the most distinguishing characteristics of pterosaurs, and arguably the feature for which they are most famous. Pterosaurs were the first group of vertebrates to evolve flight. The first pterosaurs appear in the Late Triassic, while the first birds did not appear until the Late Jurassic, nearly 80 million years later. Bats did not arrive on the scene until much later still. Even after the appearance of birds, pterosaurs maintained a position as the dominant large-bodied flying vertebrates, as well as the primary flyers in coastal and open ocean habitats. The success of pterosaurs for nearly 135 million years likely had much to do with their very well developed, and unique, flight-related anatomy. We now know that the flight machinery of pterosaurs was efficient and powerful. The specific manner in which they took off and flew also tells us a great deal about pterosaur evolution. Now that we understand more about pterosaur flight, we have a much more complete idea of how some species became so large, and why pterosaurs were especially diverse in particular habitats. The primary wing is referred to as a brachiopatagium (arm wing). The pterosaur wing would have produced large aerodynamic forces for both propulsion and weight support, just as in living flyers. Unlike the wings of birds, the wings of pterosaurs would have tended to change shape under aerodynamic load - something often referred to as 'passive cambering'. Camber refers to the curvature of a wing in cross section. Because pterosaurs possessed membrane wings, the wing would have been elastic (though we do not know exactly how compliant the wing would have been) and this would have allowed the wing to stretch slightly when producing fluid forces (i.e. lift and drag). This stretching would result in a slight upward "bowing" of the wing membrane, thereby increasing camber. At the same time, it is plausible that active mechanisms (i.e. muscular actions) in the wing membrane could have limited passive cambering or allowed different regions of the wing to differ in their response to external forces - thereby producing variable camber over the wing. The compliance and shape of the pterosaur wing was likely capable of producing very large lift coefficients. Work by Colin Palmer and others has demonstrated that a pterosaur wing allowed to camber completely passively during flight might very well have achieved lift coefficients of nearly 2.0 for short periods of time, which is quite high for a large flying animal (by way of comparison, large birds usually max out at a CL of about 1.6). Unsteady mechanisms might have pushed the lift coefficient even higher for some pterosaur species, especially smaller taxa. Unsteady mechanisms provide exceptionally high maximum lift coefficients in some living bats, for example (see work by Sharon Swartz and colleagues). Though the brachiopatagium was the primary source of lift and thrust, pterosaurs also had other important lifting surfaces. In between the hind limbs was a stretch of flight surface called the uropatagium. This surface falls into two major types within pterosaurs. The more basal, paraphyletic “ramphorhynchoids” had a broad uropatagium that linked across the two hind limbs. By contrast, the pterodactyloids had a uropatagium that was split, such that a roughly triangular membrane ran along each hind limb. This sometimes leads to the mistaken impression that the uropatagium in pterodactyloids could act in a manner similar to the tail on an aircraft. The tail on an airplane is a stabilizer; it produces lift downwards to generate positive pitch when an aircraft begins to nose down. The tails of birds and the hindlimbs of bats and pterosaurs might look like the tail on a airplane, but they are not (or were not, for pterosaurs) the same in function - for a pterosaur uropatagium to be a horizontal stabilizer it would need to achieve negative camber. However, the uropatagium would have had several potential uses during flight. As a lifting surface, it could help support the legs during level flight, as well as help the animal roll or pitch for tighter maneuvers. The split uropatagium of pterodactyloids would have been especially useful for producing strong turns: kicking a leg out would generate lift at an angle to the body, and thus make the animal roll or yaw to the side. In flying animals, a roll induces a turn, so pterodactyloids may have been quite maneuverable for their size. These rolling and yawing moments would supplement the primary rolling, pitching, and yawing moments produced by the wings. (As in modern aircraft, flying animals turn by changing the relative lift production on the left and right wings. This induces a roll, which induces a turn). The propatagium has been the source of a great deal of controversy among pterosaur biologists recently. It was the section of the wing that stretched along in front of the elbow and made up the leading edge of the wing between the body and the wrist. The extent of this patagium has been debated to a fair degree, but the real source of consternation has been in deciphering how this membrane was controlled. A bone, called the pteroid, projected from the side of the wrist and helped support, and move, the propatagium. There has been a great deal of debate regarding how the pteroid was attached, and thus what motions it was capable of. Most recently, Wilkinson (2007) and Bennett (2007) have published competing views of this articulation. At present, the model of Bennett (2007) seems to be more consistent with what is seen in fossil specimens, but uncertainty continues to exist. Regardless, the propatagium would have been important in altering the camber (or curvature) of the wing, and the flow of air over the leading edge. The propatagium could also be utilized to tense the wing, since it could take up slack produced when the wing was partly retracted during rapid glides. The position of the propatagium would change depending speed and conditions; it would likely take on the configuration for greatest lift during launch and landing, when a high lift coefficient is most important. There are a number of common errors made when reconstructing pterosaur wings. One error is to reconstruct the tip as being very sharp. This was an unlikely configuration, because such sharp tips can be prone to a particular form of stall (which will lead to the animal suddenly doing much more falling than flying). Living birds, for example, have somewhat rounded wing tips, and pterosaurs probably did, as well. Another common mistake is to depict pterosaurs as “ultralight” animals (see anatomy section) devoid of much muscle mass and almost floating through the air. In reality, it is the ratio of power to weight that is truly important for flight, and a super-light animal simply will not have enough power to push itself through the air. In fact, contrary to common perceptions, being somewhat heavy, relative to wing area, can be helpful for certain types of flyers. In particular, it is an advantage for rapid gliding in open areas, such as the ocean. Pteranodon soars over a stormy ocean. A relatively high wing loading may have helped such ocean soarers penetrate into high winds and glide rapidly to search for food. Many pterosaurs were big-bodied, marine animals. Their propensity for life over the open ocean may have come from the structure of their wing, which lent itself to the formation of a shape with a high aspect ratio. Aspect ratio refers to the proportion of the wingspan to the average chord (that is, the length of the wing front-to-back). A long, narrow wing has a high aspect ratio. A short, broad wing has a low aspect ratio. High aspect ratio wings are more efficient at extracting energy from the atmosphere, such as in rapid soaring in marine winds and gusts. Animals with long, narrow wings make better gliders, and pterosaurs, with their extremely long wings, would have been champion sky sailors. The speed at which an animal glides is not based on wing shape, however, but instead on something called “wing loading”. This term is just a fancy label for the ratio of the body weight to the total area of the wings. If an animal is heavy relative to its wing size, it will have more trouble getting off the ground, and makes wider turns. However, it will also fly faster, especially while gliding. Fast, open-ocean gliders gain a lot of steam from being heavy, so long as they are not too heavy (or else they cannot take off). This is not to say that all pterosaurs lived over the ocean. Many of them seem to have lived more inland, such as the famous giant, Quetzalcoatlus, or the tiny, insect-munching anurognathids. There were a wide range of flight patterns demonstrated by pterosaurs, showing the versatility of their wing structure, and yet, they never seem to have generated the degree of wing and flight diversity seen in birds, which was probably the result of certain physical constraints on the pterosaur wing. Pterosaurs could not, for example, split the end of their wing into separate tips as many birds do; which is a very useful trick for slow flying (especially slow soaring). Both the similarities and differences between pterosaurs and living flying species are telling. As we learn more about how pterosaurs flew, we see that they were not weak, super-light animals barely capable leaving the ground. Pterosaurs were powerful, accomplished flyers, that achieved body plans that no other animals have ever matched. One myth that floats around the internet quite a bit is that giant pterosaurs needed special conditions to launch and/or fly. 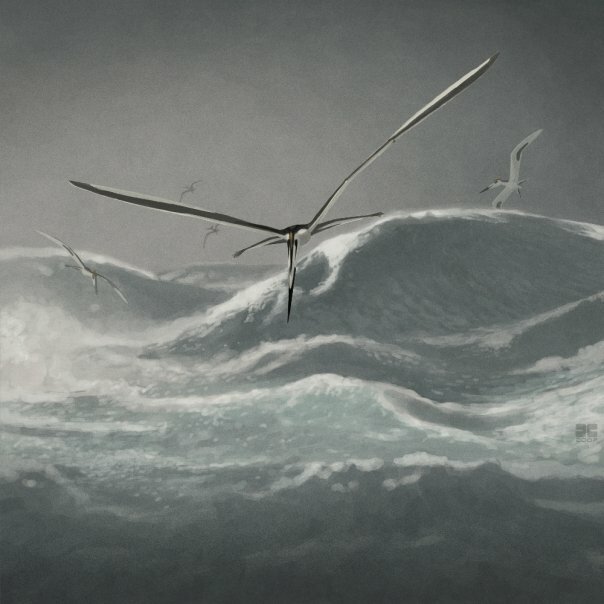 There is currently no evidence that giants such as Quetzalcoatlus needed any special wind, cliffs, or ledges to launch, nor special conditions to sustain flight. However, to understand why this is, one needs to examine the issue of scaling as it relates to flight. Scaling refers to the shape changes that occur in animals (or anything else) as size changes. As it turns out, scaling has been used as an argument that giant pterosaurs could not possibly fly. This is based upon the idea that if pterosaurs scaled like birds, then the supergiants like Quetzalcoatlus would have insufficient power to launch, and indeed, even marginally "giant" species such as Anhanguera would be limited launchers at best. The solution, as many astute readers have probably already noted, is that pterosaurs do not actually scale like birds. In fact, with regards to the limbs especially, the mechanical scaling of pterosaurs could hardly be more different from the avian condition. In birds, as it turns out, the hindlimbs scale with greater allometry than the forelimbs. In other words, large birds have stronger bones in their hindlimbs than in their wings. While this may seem strange, we must keep in mind that birds run, walk, leap, etc. with the hindlimbs only, and so as they become larger, the hindlimbs must pick up the slack. The wings, on the other hand, get something of a reprieve because flapping frequency and amplitude decrease as size increases. Therefore, the wing bones of small and large birds are geometrically similar (mostly), while the legs of large birds are especially robust. This is important to launching because, in addition to the hindlimbs of birds being the propulsive unit for running and climbing, they are also the primary source of propulsion for launch. Flying animals, as it turns out, do not flap themselves into the air - they are ballistic launchers. Those limbs in contact with the substrate push the animal into the air first, and then the wings engage. As a result, the walking limbs provide most of the power for takeoff. This is seen in insects, birds, and bats - in other words, in all living powered flyers. 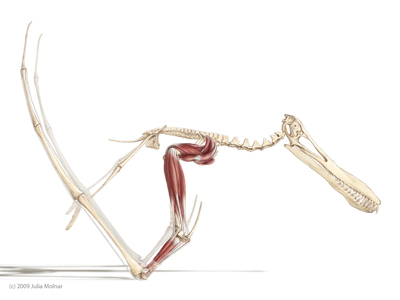 For birds, about 80-90% of the launch force comes from the hindlimbs. This immediately calls into question the idea of modeling pterosaurs as birds when it comes to takeoff ability, because pterosaurs are known to have been quadrupedal on the ground (see Terrestrial Locomotion page). As such, we might expect that all four limbs were used to push from the ground, and if so, then the wings should be especially strong in giant pterosaurs, instead of the legs. Sure enough, when we examine the scaling of pterosaur limbs we find that they are reversed as compared to birds: it is the forelimbs that become super-strong in large species, rather than the hindlimbs. Among living flyers, this type of trend is seen in bats, rather than birds. In quadrupedally launching bats, such as vampires, essentially all of the launch force comes from an initial push using both the hindlimbs and the folded wings. Because the forelimbs are so powerful, they obtain much more launch height and speed than a bird of similar size. Using a slightly different quadrupedal launch model for pterosaurs (one that takes into account the specifics of pterosaur joint structure and limb lengths) we can estimate the likely launch power for species of various sizes. When this updated model is used, we find that giant species not only could launch under their own power, but the supergiants like Quetzalcoatlus northropi should have been capable of a launch from flat ground, with no wind, in under a second. If you want to see what this might look like in a large pterosaur (in this case, Anhanguera santanae) take a look here. No confirmed launch tracks for pterosaurs are yet known (though it has been commented by David Unwin that perhaps they already exist among known trackways, because previously, pterosaur workers were searching for bipedal launch tracks. Workers are now re-evaluating known trackways to see if launches are hidden among them). However, there are a several reasons to suspect that a quadrupedal launch was more likely than bipedal launch for at least most pterosaur species. In addition to the primary evidence indicated above (quadrupedal terrestrial gaits in pterosaurs and structural shape ratios indicative of quadrupedal launching), it should also be noted that a bipedal launch is highly inconsistent with the anatomy of most pterosaurs. For all of the large pterosaurs, insufficient strength was present in the hindlimbs to initiative a bird-like launch. In addition, for most species, a bipedal launch position would have placed the wings at an inappropriately high angle of attack. The wings would effectively stall in this position, which would be particularly problematic because circulation needs to be built on the wing quickly during takeoff. Reaching steady state lifting conditions is not a trivial task, and it will typically take 5-7 chord lengths of travel for a wing to reach full circulation. This effect is known as the Wagner Effect, after Herbert Alois Wagner, who first noted the process in 1925. There are mechanisms for building circulation in a shorter distance, however, and living flyers often use such mechanisms to "kick start" lift production during takeoff. One general mechanism that can quickly start lift on a wing is to utilize high launch accelerations and open the wing rapidly during the ballistic phase. This mechanism is consistent with quadrupedal launching, and while more extensive modeling is required to investigate the prospect in detail, it is likely that even the largest pterosaurs could manage nearly full circulation on the wing in about half a chord length using a quad launch. The video linked above was produced by Julia Molnar, using the latest literature on pterosaur joint mechanics and an exact laser scan of the specimen from the American Museum of Natural History. We have run both high power and low power estimates, using different possible muscle physiology, and the same conclusion is generated in every case: big pterosaurs could launch without any trouble at all if they generated most of the launch force from the forelimbs using a quadrupedal launch. Given that the trackways, structural mechanics, and joint reinforcement all support this conclusion, it is currently considered to be a plausible launch kinematic by many (if not most) pterosaur workers. This realization also has an important underlying lesson: big is relative. While it may be intuitive to think of giant pterosaurs as pushing the size limits for flight, this is only because they were so much larger than living flyers. We must remember that several fossil birds were larger, as well, however (albeit not as big as large pterosaurs), and that the modern world need not represent the limits of biology. For flying animals, shape matters a great deal when it comes to being large.